Known for her keen artistic ingenuity and tenacious approach to generating attention to Pilsen-based artists, Lauren Pacheco has irrevocably changed the way street-art is portrayed on the south side. 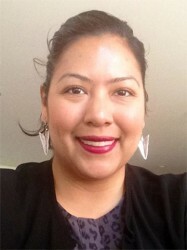 As a third-generation Mexican-American born and raised in Brighton Park, Pacheco, along with her brother Peter Kepha, founded 32nd&urban, an alternative visual art exhibition space in Chicago’s Bridgeport neighborhood from 2006-2009. The space earned two nominations for “Best South Side Gallery You Might Miss” and “Freshest Gallery.” In 2009, Pacheco and Kepha took their love of art to the next level with the establishment of the Chicago Urban Art Society (CUAS), a non-profit exhibition space and creative-use organization. Located in the East Pilsen Industrial Corridor, CUAS strives to promote contemporary artists and community organizations. Pacheco earned a degree in social work and took the initiative to strengthen and unite Chicago’s diverse arts community. Under Pacheco’s leadership, CUAS became a resource for policymakers and helped engage in the public dialogue about issues impacting artists and creative ventures. In 2011, Pacheco was hired by Alderman Solis to help him conceptualize a ‘ward-wide’ approach to enhancing arts in the Pilsen community, through the Art in Public Places Initiative. Pacheco received the prestigious New Artist Society Merit Scholarship from the School of the Art Institute (SAIC) as a graduate student in the Arts Administration and Policy program. Her civic and community-driven participation includes Urban Gateways New Arts Forum, Chicago Votes, Arts Alliance Illinois, Governor Quinn’s Creative Economy Initiative, ElevARTE Community Studio among others. In 2013, Pacheco was runner-up in the ‘Best Arts Advocate’ category of the Chicago Readers’ annual Best of Chicago issue. ComEd supports art in the community by sponsoring events such as the “Day of the Dead” exhibit at the National Museum of Mexican Art. The exhibit is open now through December 15.